Sixteen-year-old Nicki is sent to stay at her grandfather’s cabin near the town of Punishment in the Mendocino Forest. As always, she hides her burn scars and keeps quiet about the mother who ran out on her. But soon after arriving, she begins to suspect Grandpa is also keeping secrets. Her exile brings an unexpected bright spot—Grandpa’s German shepherd, Queenie. The hunky neighbor boy’s another plus, though she quickly starts to doubt his honesty. The hill climb seemed endless. Up, up, up we went, keeping beneath the cover of trees and shrubs. Other than the fact that Queenie periodically growled at Ben, the dog seemed to enjoy the journey. Though the pine-scented air felt cooler under the trees, my T-shirt soon became soaked with sweat. I wanted to take a drink from my canteen and pour some water into my palm for Queenie, but worried about the etiquette. Would I have to offer Ben a drink? I wasn’t sure I wanted to swap germs with the guy. I longed to ask how much farther we had to go, but held off. He sounded pissed enough the last time I asked. Instead, I kept my mouth shut and continued climbing. Ben stopped, held up his hand. He leaned in, his body heat adding to the day’s warmth as he whispered in my ear. “We gotta keep real quiet now. Watch where you step. Try to make as little noise as possible.” He moved off, walking in a strange semi-crouch. I tried to mimic his stance as I followed. He stopped at the hill’s crest and knelt behind a tree. I hunkered down in his shadow, my arm around Queenie. Below us stretched rows and rows of bright green plants. Slender pines edged the field. Two men walked between the rows, the height of the crop almost to their knees. The large buds on the branches of the closest plants were easy to spot. Each man carried a plastic jug, dribbling liquid on the crop rows as they passed. The nearer of the two wore khakis plus a dirt-and sweat-stained undershirt. The distant man looked more pulled together: short-sleeved shirt tucked into his pants, hair tidy. From what I could see, other people had spent time in the clearing, too. Maybe even lived there. Hammocks hung between half a dozen trees. Empty food cans rusted in a pile. The remains of an old campfire sat surrounded by cooking pans, food wrappers, and discarded cigarette packs. On the far side of the field sat a trash heap. Two men didn’t make a mess this size. Black hoses ran between the rows of plants into the woods beyond. Now that we had settled in our spot for a couple minutes, the odor hit me. The place smelled like an outhouse. Queenie’s body tensed, but she stayed silent. I leaned down and rubbed my cheek against the top of her head. Gemma once tried growing a couple pot plants behind her garage. A gardening crew took care of their property and her parents never went behind that building. But none of the plants I’d seen before looked like this. Star-shaped clusters rose toward the sky, the glossy leaves reflecting back the sun’s rays. I stared at the sheer size of the growing area and tried to calculate the number of trees someone had chopped down. This was no home patch. This was a huge commercial operation. Ben warned me, but I hadn’t believed him. Now I knew. We were in way over our heads. A native Californian, Peggy Rothschild grew up in Los Angeles. Always a mystery-lover, she embraced the tales of Nancy Drew and the Hardy Boys before moving on to the adult section of the library. An English major in high school, she switched to art – her other passion – in college. Peggy has authored two adult mysteries, CLEMENTINE’S SHADOW and ERASING RAMONA. 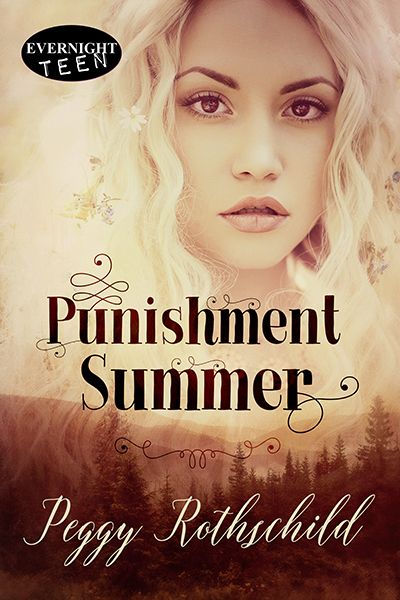 PUNISHMENT SUMMER is her first young adult novel. At present, Peggy and her husband live in the beach community of Ventura with their cats – who are always willing to rip apart any pages they feel aren’t up to snuff. In her spare time she can be found drawing and painting, or out in the yard weeding, pruning, and generally getting messy.